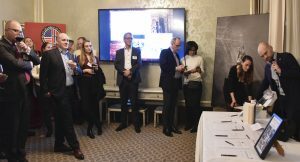 It was an evening of thanks, turkey, high spirits and charity as AmCham hosted our traditional Thanksgiving Dinner at Grand Hotel, where guests helped raise a record NOK 91.000 for this year’s charity partner – The Ocean Cleanup. 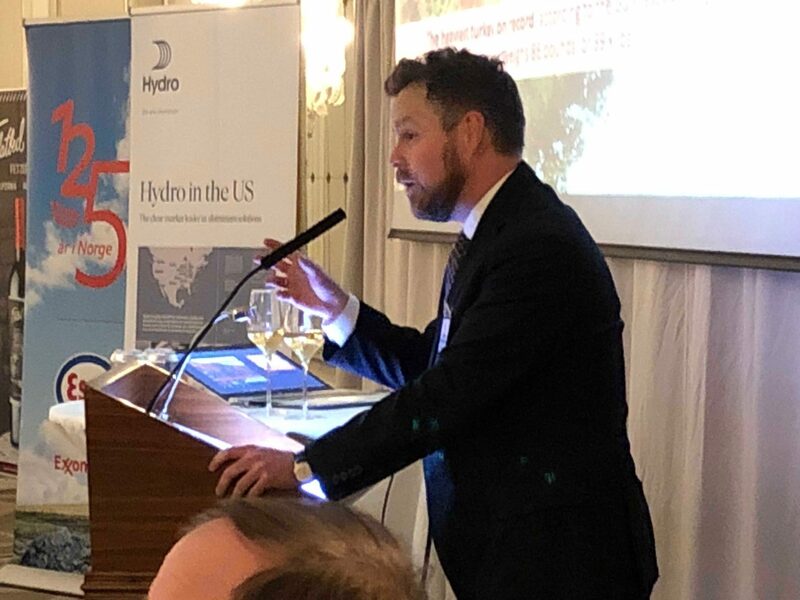 Sponsored by ExxonMobil, Biogen and Hydro, the evening included an authentic American Thanksgiving meal, prepared by the renowned Grand kitchen in collaboration with Stavanger’s legendary Chef Craig Whitson. Whole stuffed turkeys, glazed ham, sweet potatoes, and assorted American pies were accompanied by Fetzer Flatbed Red Blend and Bonterra Chardonnay from California. 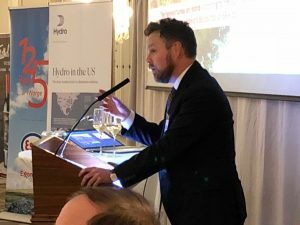 In his Thanksgiving address, Minister of Trade & Industry, Torbjørn Røe Isaksen, touched upon some of the key reasons why both Norway and the US can be grateful for an excellent relationship. “According to a report presented last year, Norwegian companies and investments are supporting nearly half a million jobs in the US. Equally, from ExxonMobil and ConocoPhillips to Accenture, Alcoa, Coca-Cola, Cargill, Bristow Norway, Mondelez, McDonald’s and 650 others, the US is a major contributor to jobs, welfare and happiness here,” the Minister said. Fittingly headquartered in Massachusetts — where Thanksgiving is rooted — dinner partner Biogen is a neuroscience pioneer, with an ambition to cure Alzheimer’s disease. Speaking just after the Minister, Country Director Kristin Nyberg noted the importance of good health and collaboration during her dinner address. 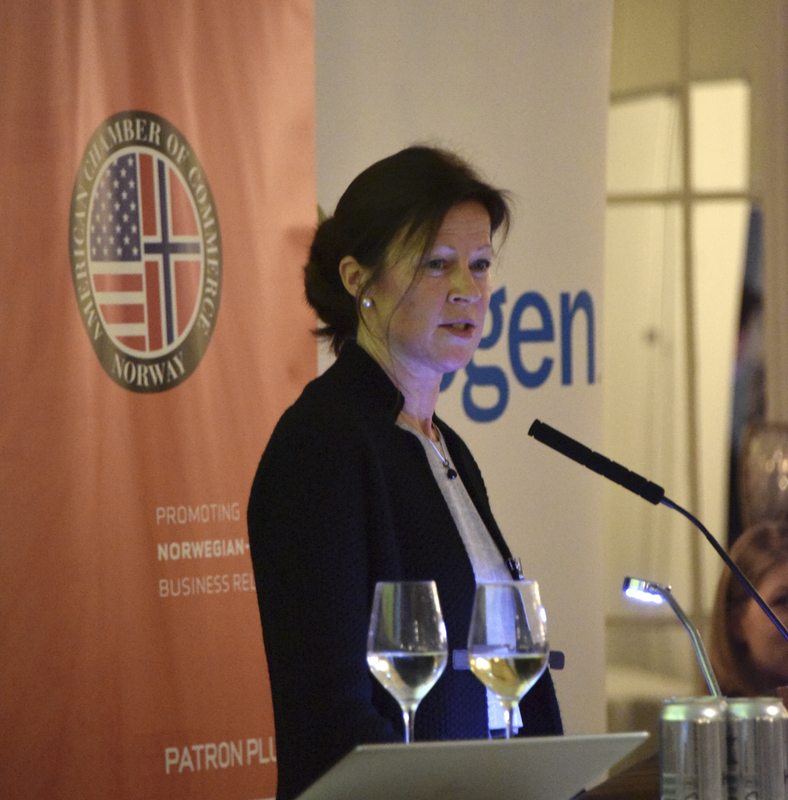 “Let’s work for such an environment to thrive within the new Life Science building at the University of Oslo, and we will make Norway an even better place to do business in the future,” Nyberg said. Following dinner and Thanksgiving reflections by US Ambassador Kenneth J. Braithwaite, guests gathered for a lively charity raffle and auction, stocked with spectacular prizes donated by AmCham member companies. Among the many winners, guests took home a large aluminum print by Pål Laukli courtesy of Featuring Spaces, an Icelandair gift certificate, an exclusive 1984 Prince photograph by Nancy Bundt, a Tesla-weekend and an all-inclusive VIP stay at Grand Hotel. 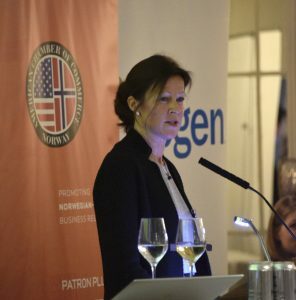 With NOK 91.000 generated for further development of The Ocean Cleanup technologies, AmCham extends heartfelt thanks to all who so generously contributed!